Our Vans will seat fourteen passengers plus our chauffeur (or 10, plus baggage space). All of our vans have front and rear air-conditioning for your comfort. AM/FM stereo with tape players are standard. 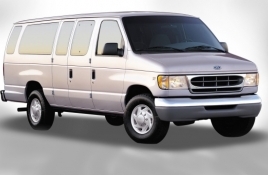 Many of our clients have enjoyed our vans when they have larger groups, or have excess equipment or luggage.